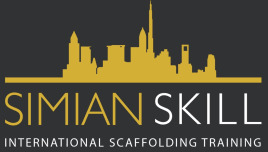 Simian Skill provide specialist training and consultancy for the scaffolding industry. 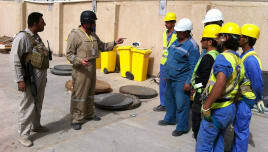 Based in the Middle East, we provide face to face training at approved centers around the world. In order for our expert training to reach more people we have now launched an online scaffolding training program. The e-learning courses aim to bring scaffolding training to a wider audience in a bid to improve standards in the industry in areas of the world where professional scaffolding may not be readily available. The e-learning will be in English, Mandarin Chinese, Hindi, Russian, Spanish and Korean to begin with and more languages will be available as we grow. We aim to appeal to large remote sites who need training and inductions in scaffolding but struggle with visas to move their men around the world. Also to inspectors and management who are querying scaffold integrity whereas they can undertake the module, download the handout and challenge the structure. This feature will be an online payment where when you pass you can download your certificate and invoice if required. Established in 2005 by a team of scaffolding industry experts with unsurpassed knowledge, expertise and experience, the Group has rapidly expanded into multiple global markets. Simian Risk now operates across a range of industries including construction, petrochemical, nuclear, pharmaceutical, manufacturing and power generation. We operate across the UK, Europe, Africa and the Middle East, supporting clients to improve and maintain standards across all operations when working at height.